I had to take my time with this post. I wanted to make sure everything was perfect and I conveyed, to the best of my abilities, the magnificence of this event. 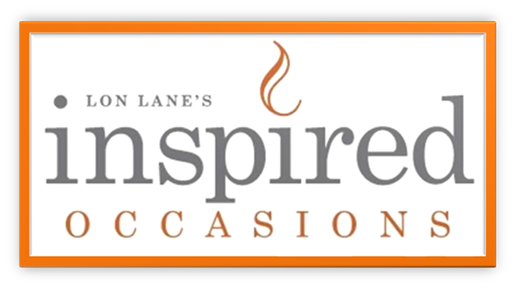 I want to share with you all an evening, no, an “Experience”, at Green Dirt Farms brought to you by Lon Lane’s Inspired Occasions. Every birthday is special, but when you have several family members celebrating together, well that’s something else entirely. This last week our clients handed us the keys to our own personal toy land, and told us to have fun! This toy land was called Green Dirt Farms, in Westin MO, and we played…oh how we played! Before I give you the details, I feel the need to tell you how this whole thing started. 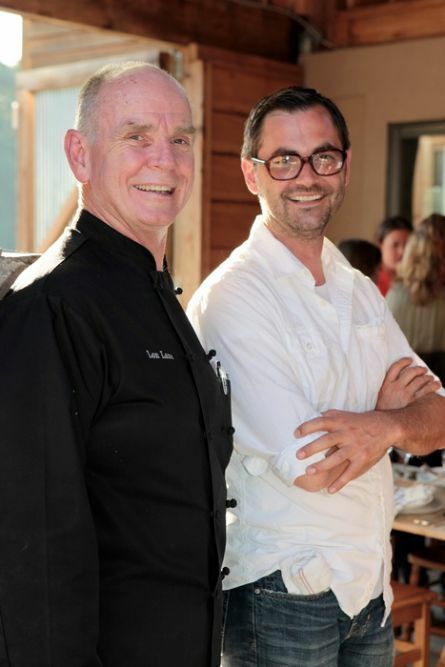 Several weeks ago my dad walks up to me, adorned with that devilish smirk he often wears when he is about to drop some amazing news upon our ears, and informs me that we will be doing a dinner at Green Dirt Farms(GDF) for 30 guests, so get excited. My mind was spinning, but where do we start? 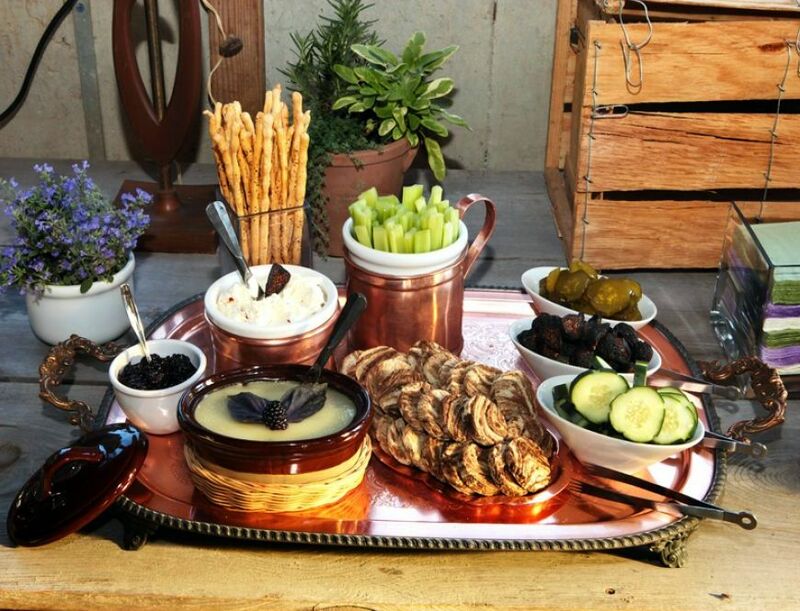 The meat, the cheese, and the very grounds themselves were ripe with possibilities for wonder and amazement. Not only that our gardens at the company were so full (we were harvesting every week!) but our list of supplies for this event was growing by the second, pun intended. The first farm on site visit set our color palate of lavender and Purple (thistles), sage greens, blackberry (just in season) and lemon that will be used throughout the meal. This dinner prep started two days before the actual event. A delivery man in beat up jeans and worn in work boots came knocking on our door with two fully dressed spring lambs in his hands. 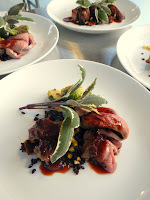 These were beautiful and tender, and our chefs and I got to work exuberantly breaking them down. 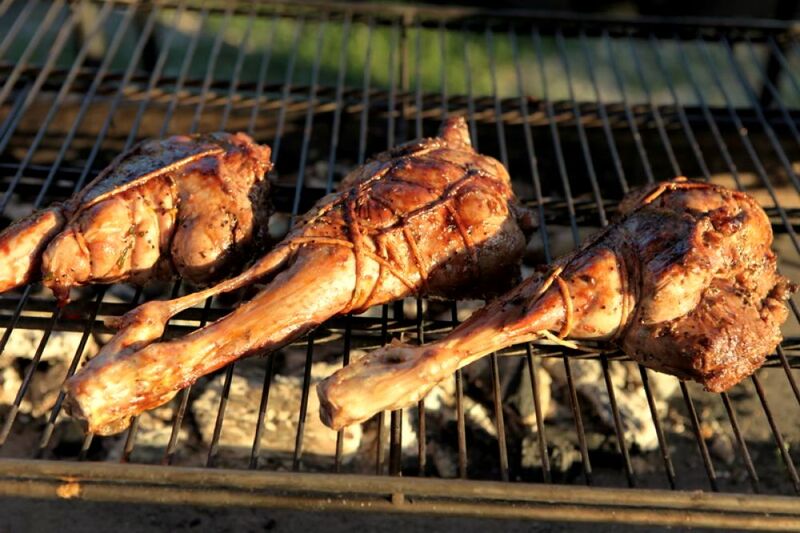 We sectioned off the legs, the racks and the chops, careful as surgeons but giddy as school children. I removed the liver and set to work on a pate, my mouth eagerly awaiting the final product. Now out at GDF I must say we were all speechless. 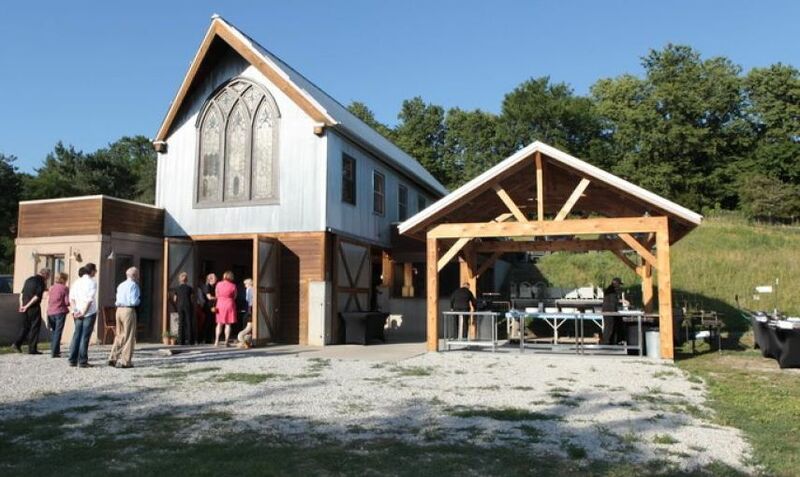 The grounds were immaculate, the old lamb barn was beautiful and the stained glass window in the barn bathed the entire family farm table in a radiant, rich glow. Our kitchen crew set to work preparing the grills, organizing the kitchen, and prepping the meat. A two man band, the Texas Experience, pulled up and soon the barn was full smooth classic country songs and the sweet smell of the grill. As the guests arrived they were greeted with wine, beer, and a signature cocktail called the “GDF Thistle” (a mixture of scotch, bitters and sweet vermouth) full service bar and wines carefully selected to compliment the menu. With cocktails served, we awakened their taste buds with a crock of lamb liver pate highlighted with cassis and served with a blackberry, basil and cassis jam and rye toasts, an assortment of house crafted pickles, GDF fresh peppercorn sheep’s milk cheese, figs, salt and pepper grissini, sticks of celery, and rounds of garden grown cucumbers. While the guests milled about admiring their surroundings we passed a few delectable little bites, watermelon radish canapes on white bread with salted butter, grilled lacquered bacon wrapped cassis poached figs stuffed with sheep’s cheese and smoked almonds, and (a favorite of mine) grilled whole grain pizza topped with GDF nettle sheep’s milk cheese, watermelon radish tops, caramelized onions and thistle from the grounds of GDF. 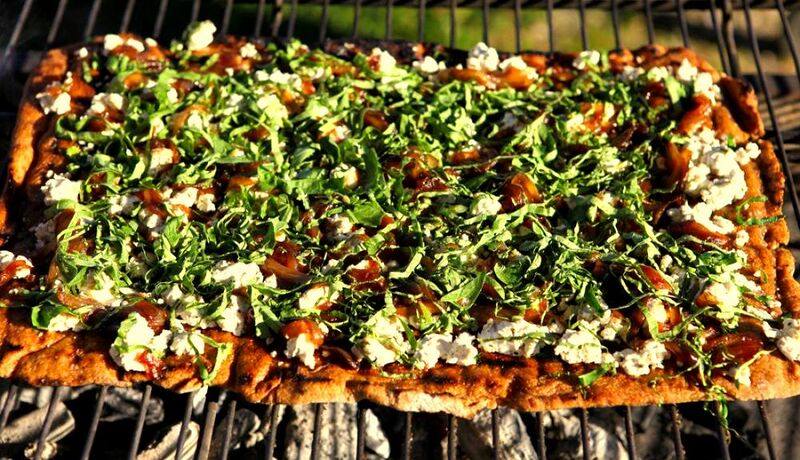 The grill perfectly mimicked the char and crispy crust you get with a tradition wood burning oven; I practiced this pizza crust several times on my new Broil King at home to make sure I got everything right. As the guests found their seats, the Texas Experience band started to play a little softer and Dad and I entered the barn to introduce the “experience” describe the first course; chilled watermelon radish top soup with GDF fresh yogurt, diced pickled radish and fresh cucumber. This was a fun dish to create because I love radishes but never had any use for the tops. However, the flavor and texture of the young radish tops reminded me of another unused and often discarded green, nettles. So we adapted a nettle soup recipe from my grandparents and created a beautiful bright green soup that is vibrant, yet subtle and refreshing. The gentle crunch and bite from the pickled radishes paired so well with the crisp fresh cucumber while the fresh yogurt added another tangy-velvet element rounding out the soup. 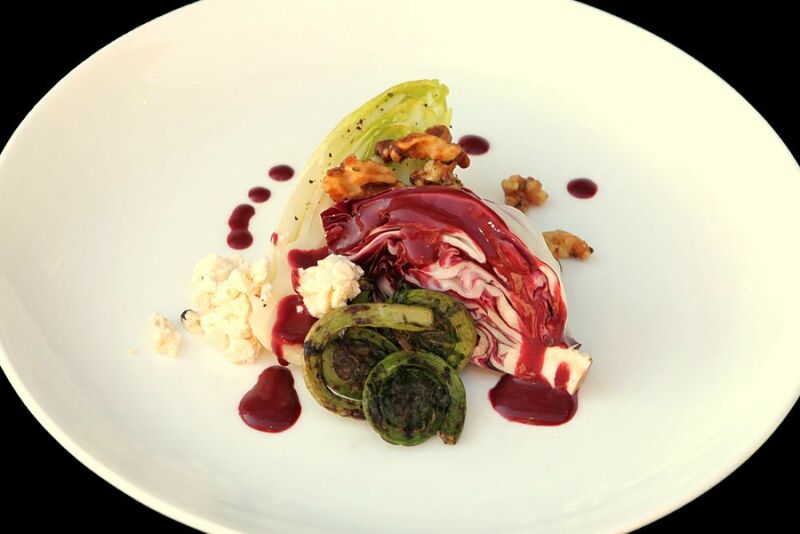 The next course was an all grill salad, grilled endive, radicchio, and fresh fiddle head ferns topped with GDF Spicy sheep’s milk cheese, rosemary walnuts and drizzled with blackberry vinaigrette. The texture and crunch of the grilled lettuces and the soft spiciness of the sheep’s cheese was brought into balance by the tart and sweet dressing while the fiddle heads provided an added nutty and earthy touch. The plates returned to our kitchen “sparkling” clean! On to the main event, the Lamb! We rubbed the lamb with olive oil, rosemary, lemon and cracked black pepper. 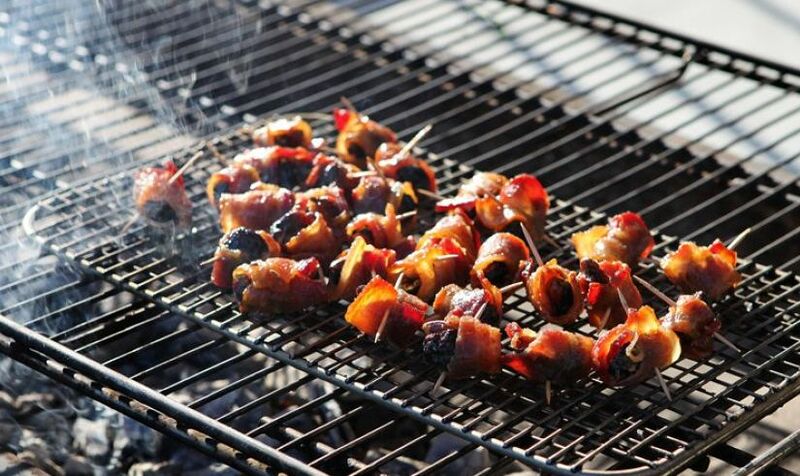 Once it hit the grill we seasoned each piece with a dusting of kosher salt and when they were almost done, we glazed them with a blackberry currant mint sauce. It was the second prettiest thing I have ever seen! 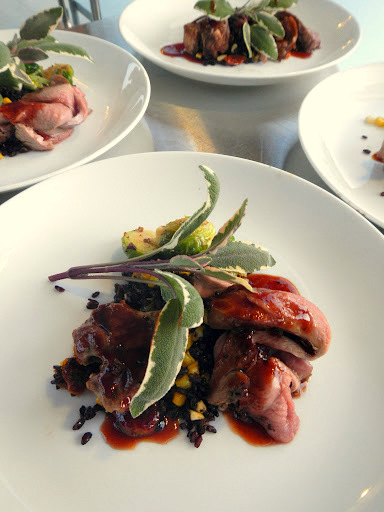 We plated up this course with black “forbidden” rice tossed with oven roasted grape tomatoes and fresh corn cut from the cob. Sautéed Brussels sprouts with a whole grain mustard and crisp chardonnay glaze finished the plate. Later, we passed the racks on copper trays for an added flair. The dessert was a triumph in my eyes because we made one of the best ice creams I have ever tasted, fresh GDF sheep’s milk cheese and lemon verbena Ice cream. Picture the best cheesecake you have ever had, and then melt that down and make an ice cream. The texture was a mixture of silk and velvet while the cheese and lemon verbena provided a subtle yet pleasant tang. 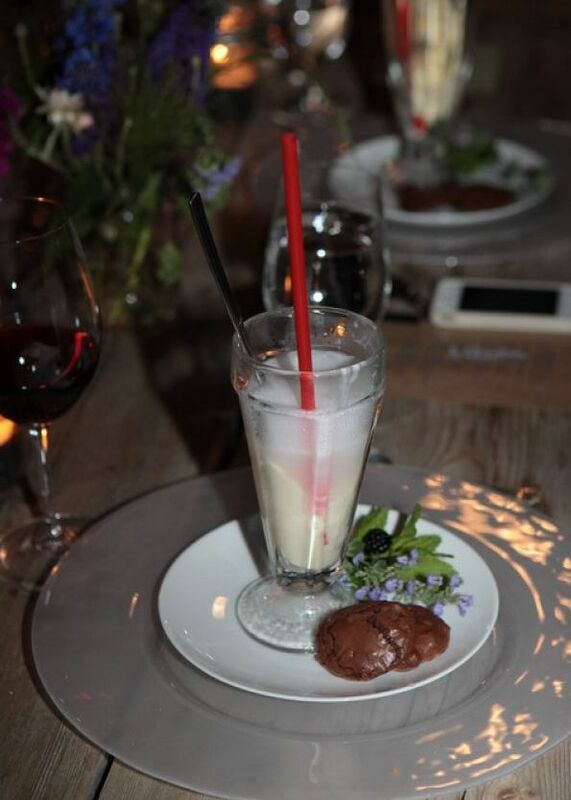 We scooped the ice cream into old fashioned soda glasses and topped them off with sparkling French lemonade tableside served with our signature chocolate soufflé cookies . 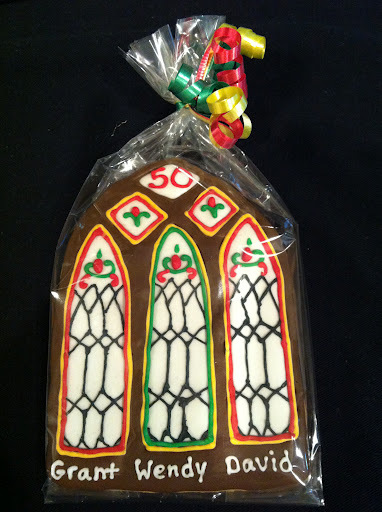 As a parting gift, each guest was presented with a bagged and decoratively tied cookie that replicated the intricate stained glass window; the “Trademark” of the old lamb barn turned dining room. The three panels of the window represented our three Birthday celebrants and the cookies were inscribed with each of their names under each of the three panels. 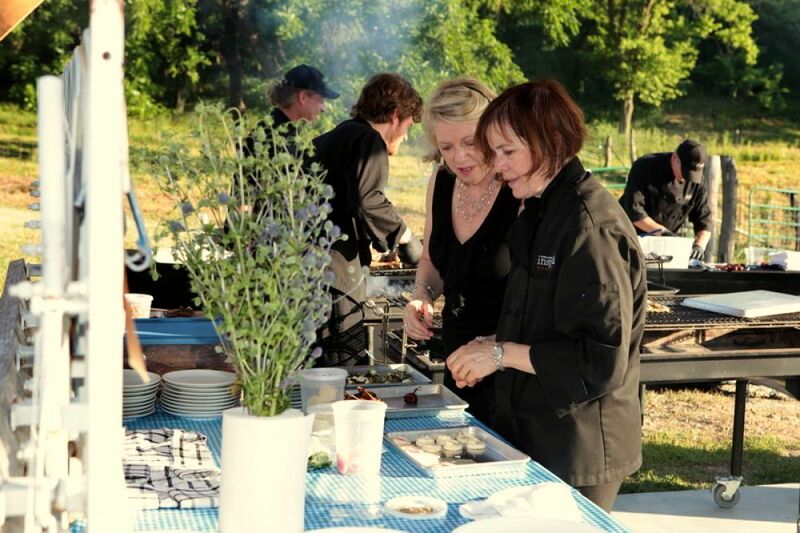 We have attended some amazing dinners, cooked a few more, but we have never had the honor to produce anything like this “farm to table dinner” and “dining experience”. That night, under a clear star studded sky, we were players in what turned out to be the “Perfect” evening. It was a rare moment that will stay with us (and especially me) forever.